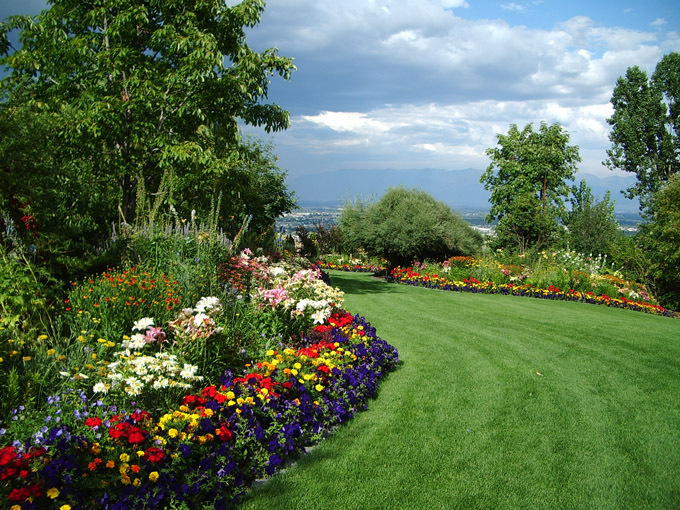 Bibler Gardens is a private display garden in Kalispell, Montana designed by Louis A. “Sam” Bibler. Sam landscaped, planted and maintained the gardens at his home from around 1979 until his death in 2002. The extensive gardens, including ponds, waterfalls, sculptures, arboretum, and a log stable with a menagerie of miniature animals, are maintained today according to Sam’s desire to preserve the site as a place of lasting beauty that could be enjoyed by the Kalispell community and visitors to the area. The Bibler home and its furnishings have also been preserved. The beautifully designed home features 18th and 19th century art and furnishings, as well as an outstanding Persian antique tribal rug collection completed in 2011, and an important collection of Cape Dorset Inuit sculpture and prints. Public tours of the Bibler Home and Gardens are conducted at least twice annually, in the spring when thousands of tulips and daffodils are at their peak, and again in the summer when massive plantings of a wide variety of perennials and annuals reach their peak. These events also provide an opportunity to view the interior of the beautifully furnished home. Copyright © 2019 Bibler Home and Gardens.